On the odd occasion, you may discover that your bar stool has developed a slight wobble. This could be due to a number of reasons, but please don’t fret as each one is easy to fix. It may be as simple as the stool not being assembled correctly or it may have started to wobble due to constant heavy usage over time. The first step to fixing it is to determine where the actual movement originates from, and this will depend on its design and construction. We suggest you start at the bottom of the stool and work your way up, whilst gently rocking it with your hand to find out where and what the problem is. 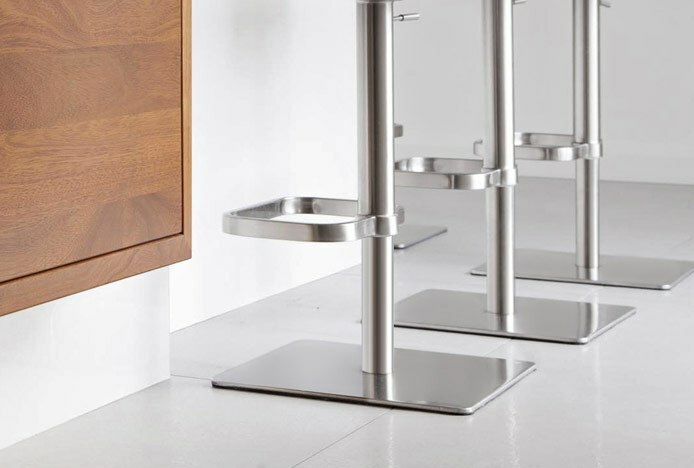 Over the many years of selling stools, we have progressively improved and adapted our designs to the highest of standards in order to minimise the chance of this happening. So it’s highly unlikely this will be a problem with our products, but we have created this article to talk you through possible causes and solutions, if you do find yourself with a wobbly bar stool. The most common cause is an uneven floor surface, a particular issue in older homes with traditional tile or slate floors. However, this is rarely the source of the problem if you have a brand new floor or a smooth surface like vinyl. With old tiled flooring there are often uneven tiles that do not line up exactly, which creates ‘lippage’ between the adjoining tiles, causing the base of the stool to rock. It may also be the texture of the floor, as some forms of slate have a naturally uneven surface. This can be slightly more problematic for four-legged designs compared to those with bases, as the larger surface area of the base will help to balance the stool. The simplest solution would be to place a matt underneath the stools, or relocate them to get around the uneven surface, but we appreciate this is not always possible with fitted worktops and breakfast bars. Rather than trying to fix the floor, a cost effective and non-destructive answer is to increase the floor pads on the underside of the base. Simply add an extra pad where it sits on the uneven surface. This can be done on our flat based and four-legged stools and will help them to balance. To counteract this problem, we have introduced some designs with adjustable height feet. As seen in the Jive and the Zizi, the feet are able to screw in and out to create the height balance you need. If the floor itself is not the problem, try checking the protective ring or pads on the underside of the base or legs. Sometimes if the stool has been dragged across the floor, it can affect or damage the underside of the base. If you have a stool with a domed base, the protective rubber guard underneath may have buckled or come loose due to being caught on the floor. Similarly, with flat based designs one of the protective pads may have been pulled off whilst dragging the stool. 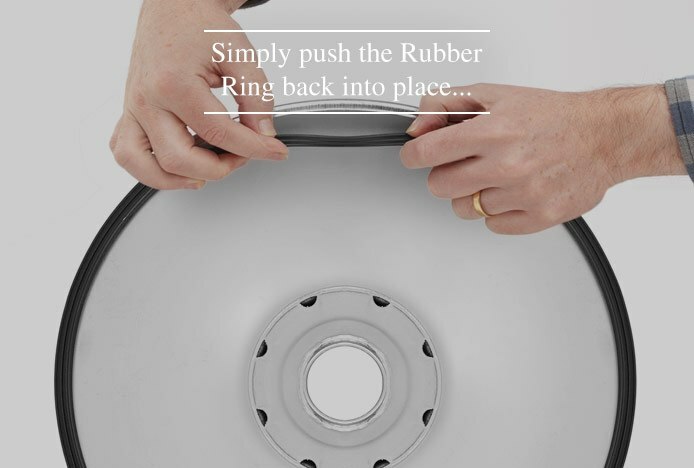 The solution here is very easy, simply push the rubber ring back into place on a round base, and for a flat base you will need to use some adhesive to stick the felt pad back on. The rubberised ring and felt pads are included to prevent damage to your flooring, so be sure to resolve this issue as soon as possible to help keep your floors in excellent condition. Remember, many of our designs have a 360-degree swivel mechanism that allows you to get on and off without moving it. Should you need to move your stool, we advise that you lift and carry it to avoid any problems. Most bar stools will naturally have a slight spring in them, allowing for some movement when seated and when getting on and off the stool. This is completely normal, however, if it starts to feel unsteady you should check for excessive movement between the base and the column. As you may have noticed when assembling the stool, a flat base is connected to the central column via three strong bolts. Over time and with general use these bolts may work slightly loose and cause movement between the base and the column, but not to worry as there is a quick and easy solution. Simply tighten each bolt one at a time and gradually, making sure you tighten each screw more than once, as tightening one bolt can create slack in another. To do this you can use an Allen key, which is included with each of our stools. You may also choose to use a metal adhesive such as Loctite to fix the bolts in place, but bare in mind that this is a permanent solution that cannot be undone. 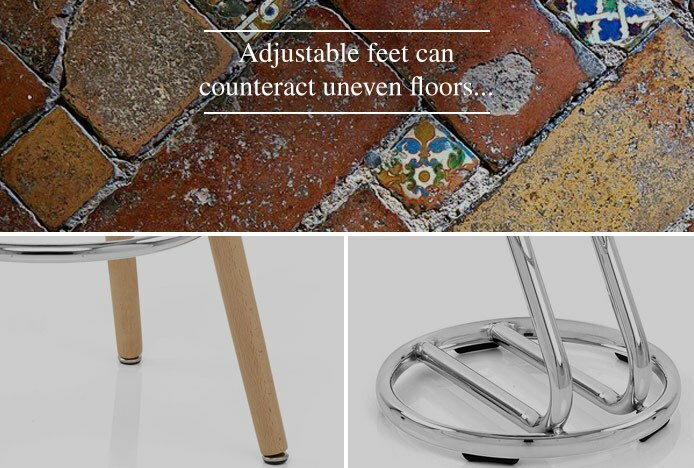 If you have a wobbly stool with a domed base, it is very rare that the cause is due to movement between the base and the column, however rocking on the stool and excessive weight can occasionally create this problem. So as to safeguard the chance of this happening, we have strengthening the components used in our products. Putting the bar stool under extreme weight with associated rocking can force the welds on the underside of the base to break, and in severe cases, the domed base can warp inwards. If the welds break, the column may sit at an angle, which causes the flange (the circular hole in the base) to become oval shaped and allows the column to move more than necessary. In this case the only solution is to replace the base or replace the stool, but don’t let that put you off, remember this is incredibly uncommon and we have put precautions in place to reinforce our stools. One of the ways we have minimised the chance of this occurring is by improving the type of weld and thickening the metal from the British standard 1.2 microns to 1.5. You can find out more about the measures we take to improve the strength of our products in our Strong Bar Stools article. 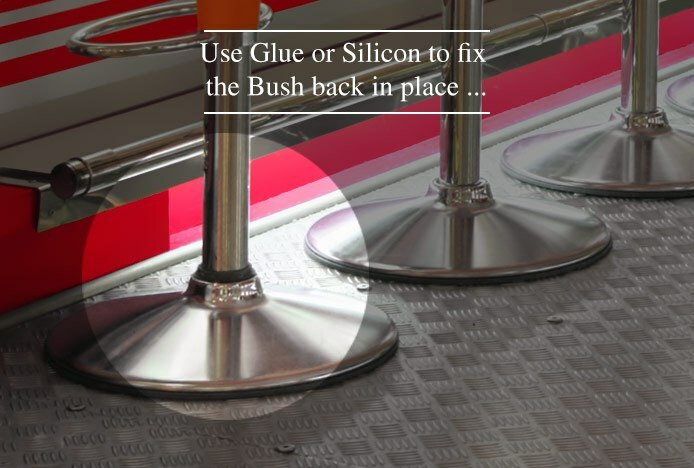 All gas lift bar stools have a plastic lining known as the bush, which lines the footrest and the gas lift column. This ensures smooth movement of the gas lift and prevents the metal inside the top and bottom of the column coming into contact. As with any pedestal bar stool, a slight spring is to be expected, but if you find that there is excessive movement it could be that the bush is the problem. Over time and with constant use, the bush may come loose from the columns and it may also fall down to the base (seen in the image below). Without the lining between the columns, the top part of the column will start to wobble because there is nothing keeping it in place. To resolve this, use glue or silicon to fix it back in place, but make sure you use it sparingly as any excess glue could ooze out and restrict the movement of the stool. Without the bush the hydraulic column may move up and down at an angle which can scratch the inside of the column, so be sure to resolve this problem as soon as possible. A few of our stools require self-assembly, and sometimes if the stool is not assembled correctly it may be wobbly. Some of our wooden bar stools are assembled via bolts, and so the tightness of these bolts may be the source of your problem. If you had to assemble your wooden stool, the cause could be that the bolts were not tightened evenly during assembly. This means the frame may be set at a slight angle and create a wobble, or it could be that a bolt has loosened over time and with general use, but this is easily fixed. Check over the entire frame to ensure each bolt is tight, and use an Allen key to tighten any that may have come loose. If all the bolts are tight but the frame still wobbles, you will need to loosen each one, realign the frame and the seat and then tighten them again evenly. When assembling a wooden stool, we always advise that you do so on the floor of intended use. Be sure to place the bolts in position before tightening them and tighten each bolt a small amount at a time. For a permanent solution, you can also use a metal adhesive such as Loctite to secure the bolts in place if necessary. You may find that the seat itself is the reason for the movement, rather than the column. In this case you should check the underside of the seat to see how it is attached to the frame. The seat on a gas lift design connects to the column with screws on the underside. It may be that these screws have loosened over time, causing the seat to wobble on top of the column. Not to worry, the solution here is very quick and easy to do. You will need to tighten the screws on the underside of the seat. 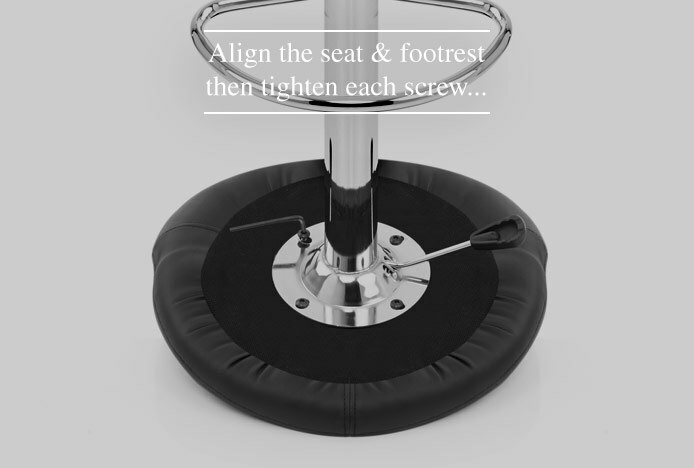 Before doing so, ensure that the seat is centrally aligned to the footrest, and be sure to tighten each screw more than once so there is no slack. 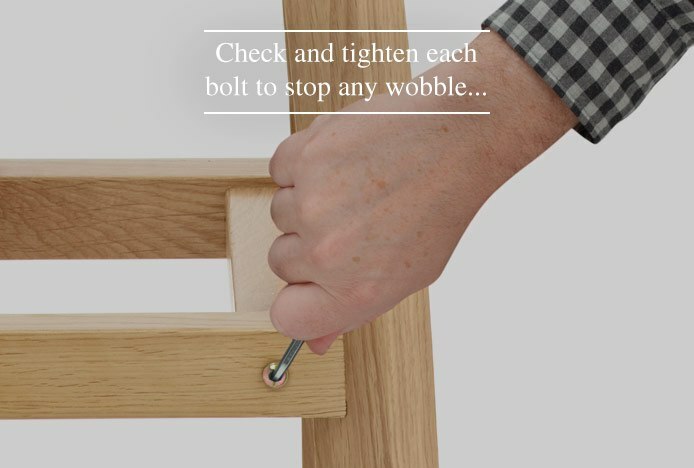 When assembling the stool, we advise you to finger tighten each screw first to make sure they are in the right position, then use the Allen key to tighten each screw one at a time until each one is firmly in place. As with any piece of furniture, a small amount of wear and tear is to be expected over time, however, in most cases an uneven floor is the reason for a wobbly bar stool. Whatever the cause, with our simple solutions listed above, you should be able to enjoy your stools wobble-free for years to come. Should you have any further queries, you can always contact us here. Please note: any repairs to bar stools and dining chairs are undertaken at a customer's own risk. Atlantic Shopping will not be held responsible for any damage incurred.